We have all sat through presentations that seem to go on forever. You know the type – the presenter drones on, not looking up from their notes, and the audience inevitably drifts off. And can’t we all admit that we would like to enhance our presentation skills? Let’s find out how to greatly improve presentation skills, from creating your presentation, to beating your presentation fears and delivering it confidently, using Mind Maps to support you. To prepare your presentation, you should always begin with a Mind Map. You can learn how with our create a Mind Map guide. Firstly, make an overall Mind Map of the logistical details of your presentation, making main branches what you want to achieve, the resources you will need and the audience you will be presenting to. By Mind Mapping all of these beginning details, you will start to focus your mind on each aspect of your presentation and its implications. Do you want to sell or inform? Is it a formal or informal situation? Once you have explored the practical factors of your presentation, you can start to Mind Map its content. Start by making a quick-fire Mind Map burst of ideas with any relevant thoughts which come to your mind, using only keywords. By doing this you counteract ‘Presenter’s Block’ and get your creative juices going – you will be feeling excited about your upcoming presentation rather than terrified! After you have created this quick fire Mind Map, you can begin to refine your ideas and what you want to say, and work out where you can insert videos or other multimedia. You should also be able to order your branches, adding numbers to sequence if you should wish. Finally, you can allocate a suitable length of time per branch for how long you wish to speak about that particular point – remember that less is more! If you want your presentation to pack even more of a punch, you can add images or icons to your branches. Images not only make presentations more visually stimulating, they also further emphasise and reinforce your points to drive them home with your audience. The more aesthetically dynamic your presentation is, the more likely your audience is to remember the message afterwards. 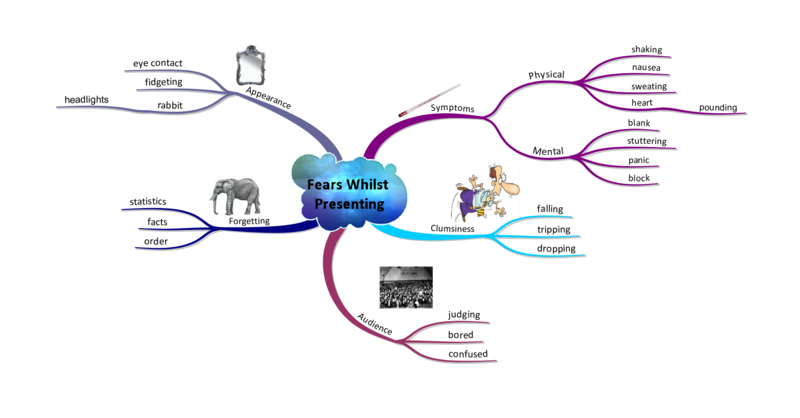 Create a Mind Map of your fears – with your central idea ‘Fears While Presenting!’. Each main branch should represent a mistake you are afraid of making during your presentation. These should include worries such as ‘Forgetting’, ‘Clumsiness’ and ‘Audience’. Explore these fears, Mind Mapping what you fear could happen, for example under ‘Clumsiness’ you could write ‘Falling’ or ‘Tripping’. After you have explored all of your fears, make a final branch labelled ‘Overcome’. You will see that many of your fears are easily beaten, for example, ‘Laugh’ could be one of your branches, meaning that even if you do trip or fall, you recover quickly and engage with your audience by laughing about it. When you feel your nerves growing when presenting, simply relax and try and act naturally – the hallmark of a bad presenter is someone who seems uncomfortable. Make your presentation conversational, as though you were speaking to friends and family. If you make a mistake in your presentation, don’t panic! As in normal conversation, we simply laugh, pause and continue. Breathe deeply and carry on, your audience will feel reassured that they are learning from such a cool, calm and collected presenter. Use multimedia, but use this wisely. Make sure that if your technology is not working, for whatever reason, that your presentation still works. Rely on your excellent presentation skills, not just your computer. Use colours, sounds, images and videos to engage your audience and to ensure that they remember your presentation. Be active! Audiences don’t engage with presenters who stand in one place, behind a lectern. Move around the stage, use gestures and facial expressions to catch and maintain your audience’s attention. Physical presentation skills are key, and you should also ensure that you are dressed appropriately and comfortably for your presentation. Use humour and anecdotes as part of your personal presentation skills. Evidently, if you are presenting to a large corporate group on fiscal management, you may not want to include that funny story about your family dog – but audiences do remember information better which is different, funny, bizarre or thought provoking. Finally, be passionate about what you’re presenting! This may seem obvious, but if you seem indifferent about what you’re saying, there’s no way your audience will listen to you. If you love your subject and have a burning desire to talk about it, your audience will feel this energy and be inspired – you will feel more motivated too! Remember: passion is your greatest presentation skill. If there is one sure-fire way you can wow your audience, it’s with iMindMap Ultimate. Not only can you create your presentation map within iMindMap, you can now use its award winning Presentation Mode to deliver it! iMindMap smoothly animates your Maps so that they grow branch by branch, keeping your audience focused. Zoom in and out on branches for emphasis, and link direct to any files, websites, spreadsheets or other Mind Maps all from within your presentation. Plus our new Presentation View gives you two-screen control, with your notes on one screen and your audience view on another, giving you added reassurance. If you are a die-hard PowerPoint user, you can export to this programme – although after you have used iMindMap Ultimate’s Presentation Mode, you may not want to! 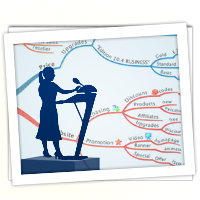 iMindMap will improve your presentation skills even further – taking your presentations to a new level of confidence.